Shanghai, China, September 6, 2016 /ChinaNewswire.com/ - Accor Ambassador Korea has announced its joint partnerships with CAPSTONE Asset Management and Dongnam Holdings to launch ibis Ambassador Seoul Dongdaemun and ibis Ambassador Busan Haeundae respectively bringing the country’s hotel network to 19 properties. 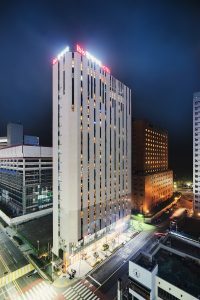 The only international hotel management company based in South Korea, Accor Ambassador is currently operating in six cities under the Pullman, Novotel, Mercure, ibis, ibis Styles and ibis budget brands, with an aggressive expansion plan that will see its current network growth from 19 to 27 hotels by the end of 2019.
ibis, AccorHotels’ main economy brand, offers guests contemporary comfort and high level service at an affordable price, with its revolutionary Sweet BedTM bedding, welcoming designer common areas and inviting food & beverage offerings. Established in 1974, ibis is the European leader in economy hotels and the fourth hotel chain in its category worldwide with more than 1,000 hotels and 134,000 rooms in 64 countries. ibis Ambassador Seoul Dongdaemun is located in the heart of Seoul nearby to Jung-Gu and Gwangjang markets. Jung-Gu market is famous for the pervasive aroma of dried seafood while Gwangjang is renowned for its silks, linens and intricate handmade souvenirs. The hotel is also located close to the Dooda Duty Free Shop which opened in May, convention and exhibition centres, shopping malls and universities. Euljiro 4-ga subway station is just at the doorstep of the hotel and a 10 minute walk to Dongdaemun Design Plaza with Myeongdong only two subway stops away. This project is developed and owned by a real estate fund managed by CAPSTONE Asset Management, in which RECAP fund is the major investor from Singapore. The ibis Ambassador Seoul Dongdaemun features 242 contemporary guest rooms furnished with the ibis sweet Bed, mini-refrigerator, rain shower and complimentary WIFI. The hotel is also home to two food and beverage outlets, Oopen restaurant, which offers a variety of pastas, grills and Asian/fusion cuisine prepared in the open kitchen, while the hip and funky Grab & Go bar is the place to chill with a pre-dinner drink or a good cup of coffee in between meetings. For meetings and events, the two state-of-the-art modular function rooms offer natural lighting and can accommodate up to 70 people. Renowned for its mountains and beaches, hot springs and seafood, South Korea’s second-largest city is a rollicking port town offering a laid-back beach vibe. From casual tent bars and chic designer cafes to fish markets teeming with every species imaginable, Busan, the summer capital of South Korea, is just a two-and-a-half-hour train ride from Seoul. The 237 room ibis Ambassador Busan Haeundae, owned by Dongnam Holdings, is a 6 minute walk to the beautiful Haeundae beach, located close to the subway station and Busan Exhibition and Convention Center. Featuring an F&B outlet that serves popular Mexican dishes, a bar, spa and gym, the hotel also offers two flexible meeting spaces that can accommodate up to 180 people in theater style and 120 guests for corporate events. “With its new bright and cheerful design of the New Candy Concept, kids club and beach access, ibis Ambassador Busan Haeundae is hugely popular with families. The hotel is perfect for guest seeking to enjoy a relaxing weekend by the beach with friends while watching kids play with firecrackers.” said Woo Young Rho, General Manager of ibis Ambassador Busan Haeundae.